It was one of Ebi-kun's best friends birthday at the weekend (A-kun) so they had a sleep over, it ended up being almost all the boys from the football club. A-kun's dad is a fellow Brit and the coach and the classes are held in English, it is a great way for the kids to have fun, learn some football skills and use English at the same time. Unfortunately because of the distance we can't make it every week but Ebi-kun goes as often as possible. Anyway, the boys had a sleepover and that meant daddy-ebi and myself were free for the night, we went to watch the final Harry Potter film and then for dinner then the next morning we picked up Ebi-kun and went for football practice. The ninja football pinata, filled with mini ninja! Then in good pinata fashion, a scrabble for the goodies! Ebi-kun was shattered after it all, he did get hit in the face with the ball and have a big nose bleed too! We stopped for some lunch on the way back and about 2 minutes after we got in the car after lunch Ebi-kun was fast asleep, he denies having a nap, since in his mind, naps are for babies, old people and daddy's who have drunk too much beer! 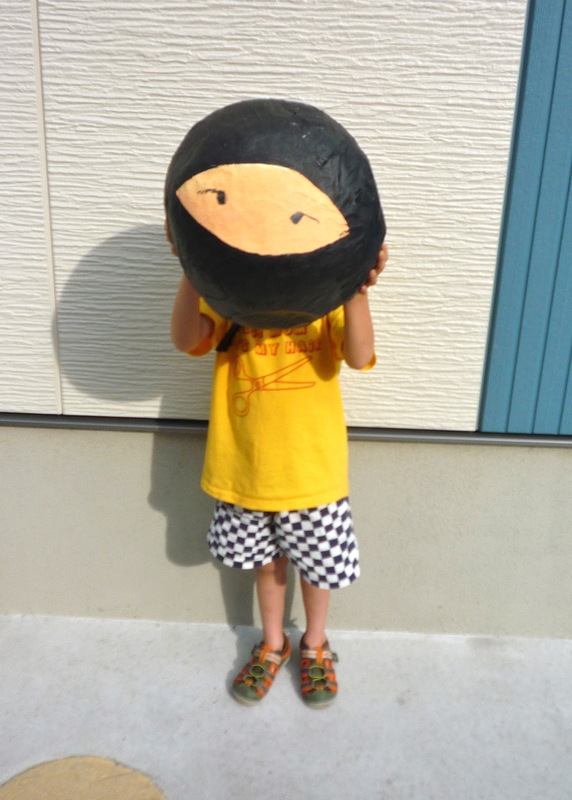 Going to pinch the idea of a pinata football - we had a pinata for M's birthday, and it was simply too tough to smash with tha taiko-no-tatsujin stick!